The original City of David, Jerusalem of ancient times, is not synonymous with the Old City. In fact, it was located on a narrow ridge south of the present-day Old City. This is the traditional site of King David's tomb. 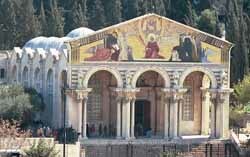 The area is also sacred to Christians because the "coenaculum" or room of the Last Supper is located nearby. The City of David borders the Kidron Valley where the Gihon Spring, the city's water source, is located. King David understood then, as do Israel's leaders today, that control of the water supply is vital to the nation's survival. One of David's successors, Hezekiah, King of Judah in the 8th century B.C.E., also recognized the importance of Jerusalem's water supplies. After Judah was invaded by the Assyrian king Sennacherib, Hezekiah built a tunnel to divert the city's water supply to a reservoir. The men dug the tunnel from both ends at once and met in the middle. It is possible to wade through the water still in the tunnel and follow its snaking path about a third of a mile (533 meters) under the city and exit at the Pool of Siloam. In 1860, British philanthropist Moses Montefiore built new housing on a hill overlooking the Old City to help relieve the congestion and poverty in the Jewish Quarter. The first of several developments was called Mishkenot Sha'ananim. Today, a unique guest house is located there, which is used by visiting writers and artists. 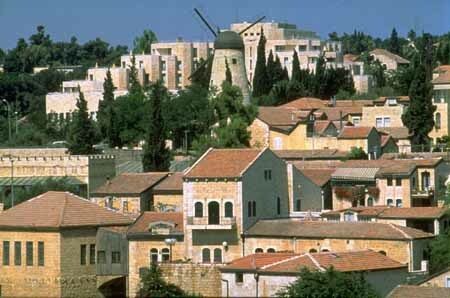 This area is called Yemin Moshe, and easily identifiable by the large windmill at the top of the hill overlooking the Hinnom Valley on King David Street. The windmill, was originally built to serve the milling needs of the residents of Montefiore's new developments, but it was never operational because of the lack of wind where it was situated. A lovely (and pricey) restaurant is also located just down the stairs from the windmill, which offers a spectacular view of the Old City walls. To the left are much sought after homes in what was once an artists' colony. The popularity of the area, however, has driven prices up to the point where only one art studio remains. A great route into the Old City is to walk down the stairs past the windmill and through the Yemin Moshe gates to the street and walk across and up the hill to Zion Gate. This takes you into the city right near the Jewish Quarter and is a relatively quick way to get to the Western Wall. Almost directly across the street from the windmill is Liberty Bell Park, which was established in honor of America's bicentennial. A model of the Liberty Bell is inside the park. Both the original and copy are inscribed: "Proclaim liberty throughout the land unto all the inhabitants thereof" (Leviticus 25:10). Walking downhill toward downton on the same side of the street as Yemin Moshe is another beautiful park that also offers a great view of the Old City and, just beyond that, the famous King David Hotel, the most luxurious (read expensive) hotel in Israel. Along with its reputation for its accommodations, the hotel is probably best known as the target of a bomb by the Irgun, the Jewish underground organization led by Menachem Begin during the fight to gain independence from Britain. The hotel was then the British military headquarters. The bombing on July 22, 1946, killed 91 people. Across the street from the King David is the International YMCA, one of the most beautiful Ys in the world. Its 152-foot tower is visible from much of the city and the view from the top is unparalleled. The Y also has a hotel that offers reasonable accommodations and inexpensive meals. In 1873, Orthodox Jews founded a settlement a short distance from the Old City, just north of Jaffa Road. It was just the second neighborhood built outside the city walls, and was initially home to 100 families. The name Mea She'arim means "one hundred gates" and comes from the biblical passage, "Isaac sowed in that land and reaped in the same year a hundredfold" (Genesis 26:12). Today, Mea She'arim is a unique neighborhood where strict interpretations of Jewish tradition rule and people dress in a manner common to Jewish ghettos of 18th and 19th century Europe. Women wear long-sleeved shirts and skirts and those who are married usually have shaved heads covered by wigs (sheitels) or scarves. 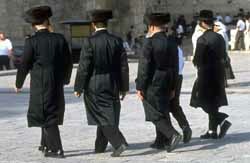 The men wear long black coats and fedoras or round, fur-covered shtreimels. Some have long white stockings and knicker-like pants, and most have tzitzit hanging below their shirts. Young boys often have very long hair (their first haircuts usually are not until they're three) and older ones long sidecurls (peyis). Mea She'arim is especially fascinating on Shabbat. People are constantly in the street, coming to or from shul. Dozens of tiny synagogues -- stiebels -- are scattered throughout the neighborhood. Men and women sit separately, usually on different floors of the bigger shuls. Go inside and you may find yourself in a world you don't recognize, where the prayers, songs and rituals are very different from those in even Orthodox synagogues elsewhere. This is also the home of some of the more ardent guardians of Judaism, who put up barricades to prevent cars from driving by on Shabbat and protest the building of roads or archaeological excavations in areas they believe may have been Jewish burial sites. Whatever your views on Orthodoxy, you should behave respectfully when in Mea She'arim and other religious neighborhoods. Signs are posted on buildings saying the Torah obligates women to dress appropriately. See our tips on how to dress. Ever since the Hyatt chain built a luxury hotel on Mount Scopus, it has become a more common base from which to tour Jerusalem. Coming from downtown, however, it's quite a hike up to Scopus, so you'll probably want to go by taxi or bus. The main attraction is the spectacular panoramic view of the city, the Hebrew University and The Mount of Olives. The Hebrew University is one of Israel's seven universities and an excellent school that has outstanding departments in a wide range of disciplines. The university also has numerous connections to the United States, from the large number of students who spend their junior year of college studying there, to the various institutes named after or funded by Americans. To name just two, there is the The Harry S. Truman Research Institute for the Advancement of Peace and the Steven Spielberg Jewish Film Archive. The University opened in 1925 and was followed by the building of Hadassah Hospital in 1934. In April 1948, an Arab force ambushed a Jewish convoy on the way to Hadassah Hospital, killing 77 Jews, including doctors, nurses, patients, and the director of the hospital. Another 23 people were injured. Mount Scopus was subsequently isolated from the rest of Jerusalem by the Jordanians, and, though it remained under Israeli control, the university and hospital were both closed and relocated in West Jerusalem. After Jerusalem was retaken in 1967, they reopened. A controversial addition to Mount Scopus was the Jerusalem Center for Near Eastern Studies built by the Mormons. A beautiful building with a stunning view of the city, it provoked a national debate because of concerns about Mormon missionary activities. The Mormons agreed not to proselytize in the city and they were subsequently allowed to create their center just down the street from the university. Visitors to The Mount of Olives stand on holy ground. Nearly 2,000 years ago, Jesus stood on this hillside overlooking the Old City making prophesies that would change the world. According to Jewish tradition, the Messiah will come through the Golden Gate (or Gate of Mercy) of the Old City and bring about the resurrection of the dead in the cemetery on the Mount. 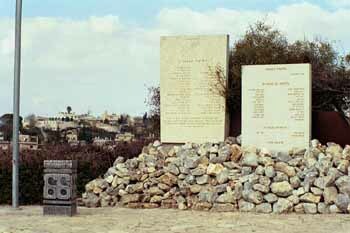 Unlike the lush expanses of grass associated with American cemeteries like Forest Lawn or Arlington, The Mount of Olives is a mountainside of stones. One does not even see flowers adorning the markers because Jews place a small stone on the grave to indicate they have visited. The cemetery sits atop a hill that was once dotted with olive trees. Given the sanctity of the place, the cemetery's terrible condition comes as a shock. Grave stones are broken and scattered. Most of the damage dates to the Jordanian occupation (1948-1967). On November 3 2014, three residents of the Jerusalem neighborhood of At-Tur were arrested on suspicion of smashing and breaking headstones in The Mount of Olives cemetary. The two younger suspects, aged 15 and 12, admitted to smashing dozens of headstones in the weeks prior to their arrest, while the 22 year old suspect denied involvement. According to Christian tradition, Jesus had a prophecy that Jerusalem would be destroyed and went down to The Mount of Olives with his followers on Palm Sunday. He then wandered around the city for about a week and taught his disciples in caves on The Mount of Olives. On Thursday, the Jewish holiday of Passover, Jesus went to a building on Mount Zion (near where Dormition Abbey now stands at the southeast corner of the Old City) and ate the Last Supper. 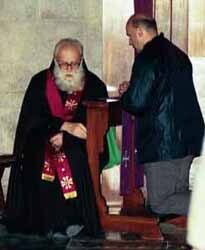 He and two disciples then left Jerusalem and went to Gethsemane and sat among the olive trees. The grove, at the base of the Mount, is maintained as it was nearly 2,000 years ago. The olive grove is within the walls of the Basilica of the Agony, which stands on the spot where Jesus prayed prior to his arrest. It is located on Jericho Road facing the Golden Gate. Inside the Basilica, pilgrims try to empathize with the suffering of Jesus. The church itself is spartan by European standards, though it has impressive murals depicting the events that took place in Gethsemane. A sculpture of thorns surrounds the spot in the middle of the church where Jesus prayed. A beautiful colored mosaic over the entrance depicts the acceptance of Jesus by the world. 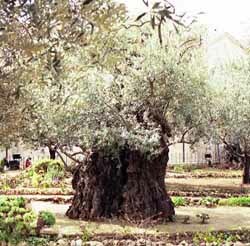 The olives of the oldest olive tree in the Garden of Gethsemane (derived from the Aramaic for "oil press"), where Jesus was arrested by the Romans, were flown to the Vatican for Pope John Paul II. After Jesus was arrested, he was taken a short distance up the hill to where Dominus Flevit ("The Lord Wept") now stands. It is beside the cemetery with a narrow road in between. The grounds also contain a cave where Jerusalemites buried their dead centuries ago. Families put the bodies of loved ones in sarcophagi. Some time later, after the flesh had rotted, the bones were removed and put In small boxes on shelves in caves. Some of these boxes are still in the cave. What is particularly significant about them is that Christian symbols were found carved on the tombs of people with Jewish names. These are the oldest remains of Jews who became the first converts to Christianity. According to Christian tradition, after the crucifixion Jesus wandered 40 days on The Mount of Olives and ascended to heaven from a point on the hill. A small shrine inside the walls of the Greek Patriarchate contains stone stumps with crosses carved on the tops that mark the spot where the disciples watched the ascension. 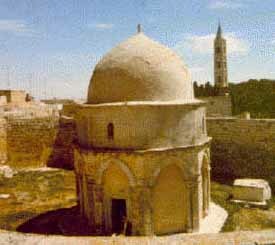 Ironically, the Chapel of the Ascension is now run by the Muslims, who built a dome over the rock from which Jesus ascended to the heavens and upon which his footprint can be seen. 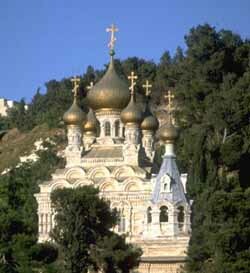 The Chapel is off The Mount of Olives Road, just above the cemetery as you travel from Mount Scopus. Further down the road is the Tower of the Ascension, today a small Russian Orthodox Church, where Mary watched Jesus ascend to heaven. 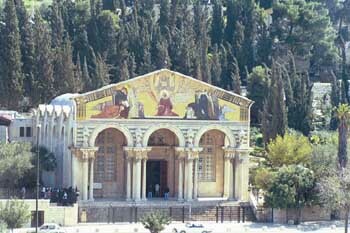 Though it has no particular historical significance, the most impressive looking church in Jerusalem is probably the Church of Mary Magdalene. This is the building that looks like all the pictures you see of the Kremlin with golden onion domes rising from the trees. 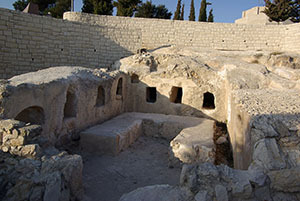 From The Mount of Olives, you can also see the conical-roofed Absalom's Tomb and the pyramid-roofed Zechariah's Tomb. These are tombs of anonymous second century citizens of Jerusalem and have nothing to do with their biblical namesakes. Prior to the Six-Day War, Ammunition Hill was Jordan's most heavily fortified stronghold in divided Jerusalem. Its central bunker served as a command post, mess hall and storage area for weapons and other war materiel. A maze of trenches and pillboxes on the hill were connected with the bunker. The battle for Ammunition Hill was fierce and cost the lives of 24 Israeli paratroopers. As a result of the victory, Israeli forces could open the road to Mt. Scopus and the fall of the Old City was greatly facilitated. These two achievements were crucial to the reunification of the city. Today, a memorial and museum are on the site. Ma’ale Adumim is a suburb of Israel’s capital, barely three miles outside Jerusalem’s city limits, a ten-minute drive away. It was established by 23 families on a hilltop in 1975. Today, it is the largest Jewish city in the West Bank, with a population of 27,300. Approximately 6,000 people live in surrounding settlements that are included in what is referred to as the Ma’ale bloc. These communities are part of the “consensus” settlements; that is, those that most Israelis expect to be incorporated into Israel when its final borders are determined.